Professor Edward Fredkin, former Director of the Laboratory, gives a seminar on "Conservative Logic." His interests include artificial intelligence, problem solving, cellular automata, and the use of elementary computational models to explain physical phenomena. 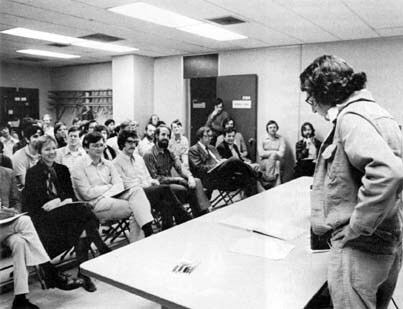 In addition to individual research group seminars, Laboratory-wide activities include Laboratory seminars, such as the above, on topics of common concern, and a Distinguished Lecturer Series, which features eminent academic and industrial people in the field of computers and information processing. This 1975 MIT Lab for Computer Science Brochure was reconstructed in HTML by Peter Szolovits, 1995. If you have comments, please email them to me.